Creating a cute gingerbread Christmas ornament is easy and fun! Making gingerbread at Christmastime is a tradition in many households. Gingerbread houses often decorate the family table during the Holidays, and gingerbread cookies are a given as gifts. However, one of the most interesting things you can do with gingerbread is to make gingerbread ornaments that you can hang on your tree and will last for years to come. These also make terrific, thoughtful gifts. 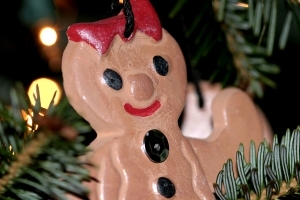 How does a Gingerbread Christmas Ornament differ from a regular Gingerbread Cookie? They look and smell the same, but they certainly don’t taste the same, and while gingerbread cookies can be soft and delectable, biting into a gingerbread ornament could invoke a trip to the dentist. When making gingerbread ornaments, the recipe is quite different from baking cookies or cakes. Ornaments are meant to get very hard after baking so that they can be painted and hung on the tree, preserved for decoration over the years. Beating the shortening and sugar together in a large bowl. In a separate bowl, sift the dry ingredients together – baking soda, cloves, ginger, cinnamon, and flour. Slowly stir the dry mixture and the water (alternating between the two) into the bowl with the shortening-sugar mixture. Refrigerate for 6-8 hours, allowing it to harden a bit. Cut the mixture into three equal pieces. Knead lighting and use a rolling pin to roll each piece into a ¼ inch thick crust. Use cookie cutters to create your desired Christmas tree ornament shapes - stars, Christmas trees, candy canes, angels, reindeer, Santa Clause, and gingerbread men of course! Use a drinking straw to pierce holes in the tops of the gingerbread ornaments so that you’ll be able to hang them. Place your shapes on a cookie sheet, and cook them for about 20 minutes at 350 degrees. You may want to turn them over a few times as they bake. For best results, let them sit out on a rack to cool and harden for at least two days. Before you begin painting the gingerbread Christmas ornaments, coat them with a clear acrylic paint or varnish, then let them dry completely. That will help the colored paint to set and not flake off. Now, you are ready to decorate your cute little gingerbread ornaments for your tree. Be sure to use acrylics for the best results. When the paint has dried completely you can use ribbon or cording, cut to 5 or 6 inch strips, to hang the ornaments, threading through the holes you made at the top of the gingerbread and knotting so that you can hang the gingerbread from branches of the Christmas tree. Note that this recipe will produce about 30 or 40 cookies, and if you don’t want that many gingerbread ornaments, the recipe can be halved. Better yet, give some away as gifts! Other applications for these adorable gingerbread ornaments include stringing them together as a garland or working together to build a wreath. If you are afraid of paint coming off and want to use these gingerbread ornaments again the following year, you may wish to add an additional coat of clear acrylic over the colored paint job to prevent it from wearing or flaking off. Most of all, be sure that children understand that, while gingerbread houses are built to eventually be eaten, these gingerbread ornaments are not and will not only be harmful to teeth but also to health. Most of all, enjoy the time with your family creating these cute gingerbread Christmas ornaments that brighten up any family tree! Gingerbread Christmas ornaments also make terrific gift tags or gift embelleshments to replace a typical bow. For more holiday craft ideas, including decorating your own ornaments, visit Holiday Crafts at The Artful Crafter. Share pictures of your own Gingerbread Ornaments here. Return Home from this Gingerbread Christmas Ornamentpage.